Use the “from” and “subject” fields to sort Emails while you are cleaning up your inbox. You should find it easier to get through your back log of messages by addressing issues with certain individual(s)… or certain subjects all at once. Quite often the most recent Email of a certain subject contains all the prior information and the older ones can be deleted. There are few things more frustrating than very slow computer performance. You are typing away, or trying to anyway and the text is not even displaying properly on the screen it’s skipping and catching up like an inchworm. You immediately start to wonder, did I get a virus? So you do the universal solution, you reboot your computer only after a short while it comes back again. This story has played out in many a local Peet’s Coffee, an office, living room or dorm room. One common culprit is indexing software that was installed as a part of an update. To quickly find files on a computer the system needs a database or index that tells it where to find the files. This prevents the search function from having to check every directory, sub folder and file and quickly directs you to the location of the files. The unfortunate thing is, the solution is sometimes worse than the problem. For years we have found machines that customers were very unhappy with the performance. “My computer was running fine this morning but now it’s slow as heck and I can’t get my work done.” The story often continues “I rebooted it and that helped for a little while but now it’s slow again”. The issue will often go away and come back, a so called “Intermittent” problem that is much more difficult to diagnose. Eventually when you connect with your IT person or learn how to use Task Manager yourself, you find that Searchfilterhost.exe is using a lot of your cpu and your hard drive or even your servers hard drives are working harder than they should be. Your computer is indexing all the content under the umbrella that you operate in including network drives and for one reason or another it has made your machine difficult to operate. There are plenty of things you can do, settings you can change folders you can exempt from this process but in reality in most cases you are better off removing the software and using the old style search utility. In this example we demonstrated what Microsoft Desktop Search does in some cases. In our experience Google Desktop and other indexing utilities have a similar impact on performance and can sometimes cause significant disruptions in performance. This leaves the operator with the choice of trying to ride it out or living with a search function that might take longer. There is definitely need here and vendors are trying to fill it, but sometimes the solution is more of a problem than the original problem. I am confident both Google and Microsoft will have answers to this question that are optimistic and confident, but the reality is the indexing programs still have a ways to go. There are many things that can go wrong and often do with this role. What if I really need to find my files more quickly? I would suggest that you leave your computer on and logged in over a weekend after installing the program. The first indexing performed by these applications takes a lot longer than the maintenance runs. I would also suggest you make sure to only use one indexing program and disable/remove the others. This may not be easy for the average user so professional help could be involved. You could also try different programs if one of them does not seem to work well with your machine. Be advised there could be underlying reasons why your particular computer doesn’t handle these programs well, that would need to be addressed by a professional most likely. Go to the actual folder (local or network) where you think the file is located to narrow down your search. Organize your files into folders that are setup in a logical manner to avoid the need to search. Name your files with a consistent convention. By doing this the data will sort very logically. Feedback requested – what file indexing solution do you use? What do you like about it? Develop a habit to save documents as you work on them, whereas not all programs come with an auto-save feature. A quick save can avoid the loss of valuable time in the event of a crash or failure. Your data is often reproducible or recoverable, but time is not! Most programs reserve the hotkey Ctrl+S to save a file. 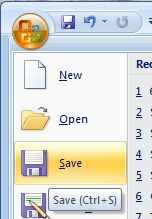 If a hotkey is available for a program, it is usually displayed next to the “save” option on the program’s “file” menu.